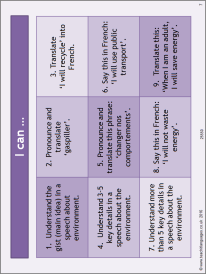 This GCSE French resource on the environment topic uses the simple future tense to talk about changes we can make to make a difference. It introduces lots of useful language with a speaking activity, interactive Matching task and a teacher read listening activity. Hi Rachel, the listening activity is teacher-read for this resource, as outlined in the resource description above. You can find the script with the teaching notes, on page 6 of the Word document. Hope this helps! Where can I find the listening file?